From time to time on this blog and our Twitter feed we give the transport industry a fair bit of stick, and more often than not, it's deserved. Shoddy customer service, dirty vehicles, poor communication, use of industry language & driver attitude have all been pulled up in various forms. But we also like to give credit where it's due, and highlight pro-active pieces of work that raise the profile of travel by public transport. 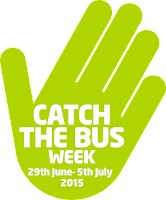 Once such activity is 'Catch the Bus Week' - a national campaign from Greener Journeys which 'is a national celebration of the benefits of taking the bus'. There lots of information about the campaign and what individual operators have been up to over on their website. And the campaign got me thinking about promoting 'the bus' in general. Could something more sustained, more on-going be done to continuously sell the bus as a product around the country? Is it feasible to get all the UK operators to club together to fund a generic (paraphrasing) 'Get the bus - it's great' advertising campaign? Something along the lines of 'This is the age of the train' idea from back in the day, but all about the bus? The reality is they all want more people to travel by bus, they all want more people to change their perception of the bus as a product, so it may well (alongside new vehicles, improved scheduling, cleaner buses, better staff training etc) be worth the investment. I'm sure such a campaign is possible. A logistical and creative nightmare granted, but possible none the less.